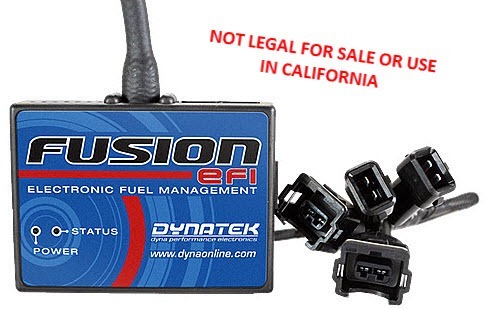 You may notice Dynatek’s Fusion EFI Fuel Controller resembles the industry standard Dynojet Power Commander PCV. The Fusion EFI shares many of the same features and accessories and is a cost effective alternative. All Fusion EFI use RPM and throttle position inputs (some models feature additional inputs like cylinder head temp, water temp, gear position or boost) to base air/fuel curve adjustments with easy-to-use software. The Fusion EFI offers a number of options for tuning from bike specific dyno tuning, the optional Dynatune accessory module or from a wide range of maps that can be shared from the PCV database. For fine tuning, the Fusion EFI maps have 250 rpm resolution and 10 throttle position columns with up to 640 individual mapping points for fuel. The Fusion EFI is effective at improving throttle response and efficiency for stock and/or modified applications. The Fusion EFI is packed with features that will enhance your motorcycle's performance. DISCLAIMER: FOR CLOSED COURSE COMPETITION USE ONLY. NOT INTENDED FOR STREET USE. If it’s ignition system or electronics related, Dynatek is the performance leader for quality electronic products in the motorcycle industry. With the help of top racers and tuners around the world, Dynatek has worked to create the electronic products necessary to support the modern motorcycle. From Old School ignition related components to modern day EFI applications make sure it has the Dynatek name on it you can trust.